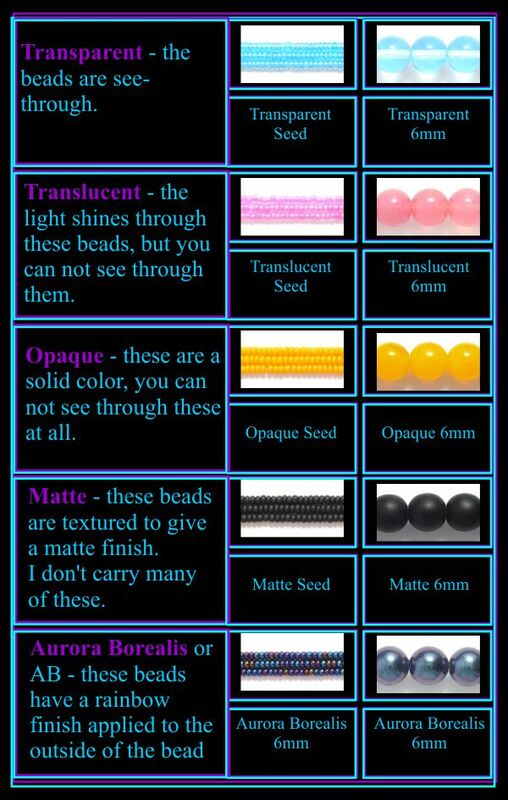 Bead Finishes : Beading Patterns and kits by Dragon!, The art of beading. Transparent - the beads are see-through. Translucent - the light shines through these beads, but you can not see through them. Opaque - these are a solid color, you can not see through these at all. Silver Lined - these beads are lined with a silver metallic color so that when you look at the bead it reflects the light through the color. Copper Lined - these beads are lined with a copper metallic color so that when you look at the bead it reflects the light through the color. Bronze Lined - these beads are lined with a Bronze metallic color so that when you look at the bead it reflects the light through the color. 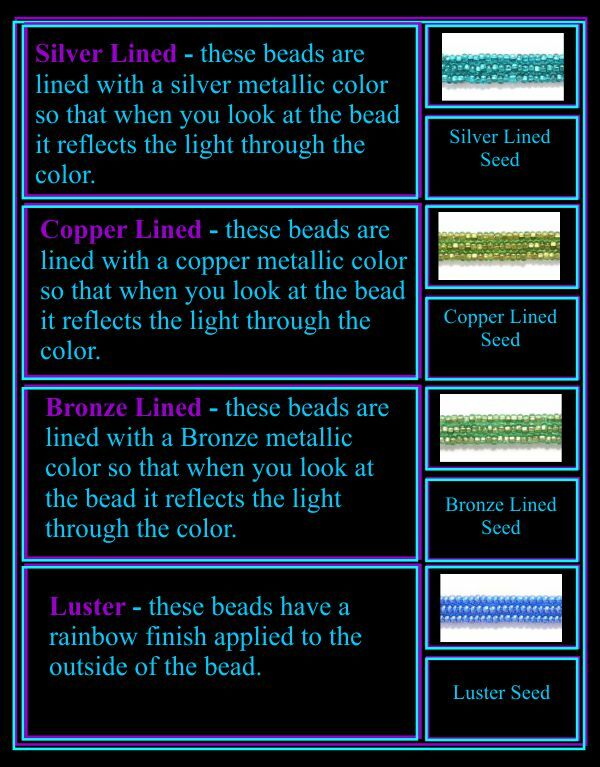 Luster - these beads have a rainbow finish applied to the outside of the bead. Aurora Borealis or AB - these beads have a rainbow finish applied to the outside of the bead. Point of interest! Black beads are not truly black. They are a very deep Purple. I don't know how many times I've said and heard others say "beading gives me a purpose. Now explaining the purpose of beading is a whole other thing!! We bead because we like making things, pretty things. Beading keeps our hands busy when we can't do anything else. We bead because it calms us down. Sometimes beading goes beyond just calming us, beads helps put the pain aside. I think it has something to do with the counting, and the rhythm. Beading can be very addicting!! First, beads draw you in with their pretty colors, all their hues, and the feel of the beads can be enticing. Smooth, rough, tiny, some are almost perfect and others are "all wobbly". Sometimes beads even make me laugh.